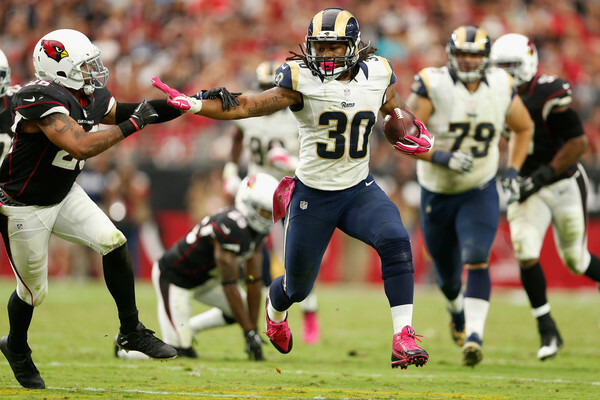 Todd Gurley burst onto the NFL scene in a big way in 2015, even though it took a few games to get his health to the point where he was ready to take over in the backfield for the St. Louis Rams. Once he did, though, there was no turning back for the rookie running back. Gurley was so good in 2015 that he went down as one of the best running backs in the league. As you can see, Gurley was next to some impressive company and did it all while playing in just 13 games. The same can actually be said about Freeman, Williams, and Johnson though, as none of those three players were full-time starters for their teams. While that’s a pretty impressive list, the question is, what should we expect fantasy football-wise from Gurley in 2016? Better yet, can Gurley work his way up that list and finish as one of the top two fantasy running backs? For Gurley, it won’t be as easy to be massively successful in 2016 as it will be for a few other names on the list above. For a hypothetical situation, we’ll assume that all of those running backs remain on the same teams they were on in 2015. In that case, any NFL fan would probably take any other starting quarterback over whoever will likely start for the Los Angeles Rams next year. That’s the bad news, because the lack of a strong passing attack will make life just a bit tougher for the second-year running back in Los Angeles. As for the good news? Well, with the lack of strong quarterback play, it’s pretty obvious that the Rams will give the ball to Gurley as often as he can possibly take it. 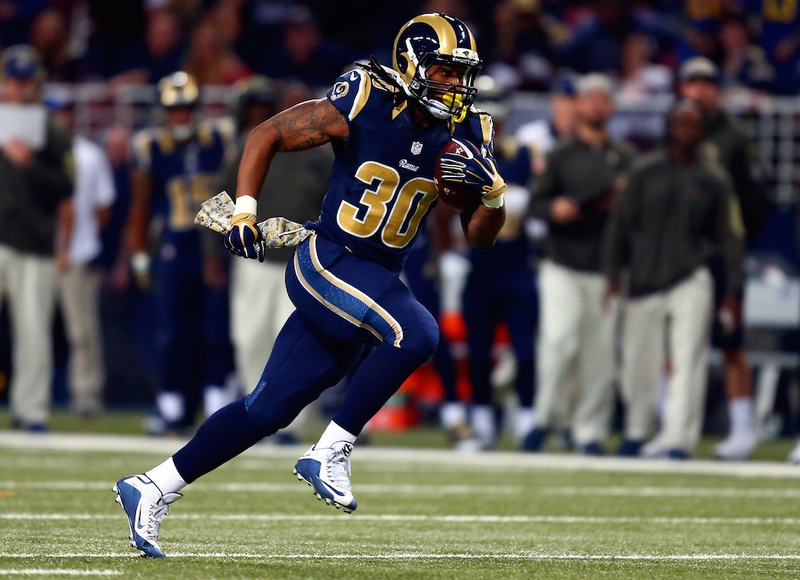 Through 13 games last season we saw Gurley tally 229 carries for 1,106 yards and 10 touchdowns. He topped 19 carries eight times, while falling below nine carries just one time (in his first game played). 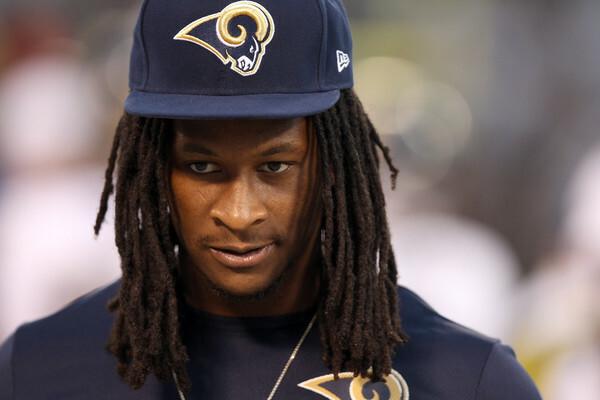 Gurley will obviously be the focal point of the Rams offense next season, but it would still be nice for the Rams to find a solid passing game to help ease the pressure off him. Only time will tell, but he should still be in for a huge fantasy season, and he will be one of the first running backs drafted. It’s an interesting mix, as Bell, Johnson, and Freeman are all stellar pass-catching backs, while Gurley and Peterson are really the ground-and-pound type of backs. Regardless, as we saw in 2015, there’s more than enough potential for both types of running back to excel. Gurley will bump up from the No. 5 spot to No. 2, and will finish with somewhere around 1,300-1,400 yards with 13-15 touchdowns rushing. The only reason he won’t take the top spot is due to Bell’s exceptional ability in the passing game.